"It seemed an advantage to be traveling alone. Our responses to the world are crucially moulded by the company we keep, for we temper our curiosity to fit in with the expectations of others...Being closely observed by a companion can also inhibit our observation of others; then, too, we may become caught up in adjusting ourselves to the companion's questions and remarks, or feel the need to make ourselves seem more normal than is good for our curiosity." Traveling alone – especially if not fluent in the language – ain’t for sissies because there can be a lot of meals eaten in silence. On the other hand, sometimes the best part of travel is being alone. As de Botton points out, if you’re always comfortably traveling with people you know, you run the risk of responding to them instead of to your own curiosity about the people and places you come across. While Brad is at the university during the day I’m a solo traveler. So as I’m getting ready to leave Dijon this year, I want to introduce you to some of the people who brightened my days, even if I could hardly speak a word of their language. My three Dijon friends enlivened this summer immensely with their energy and good cheer. 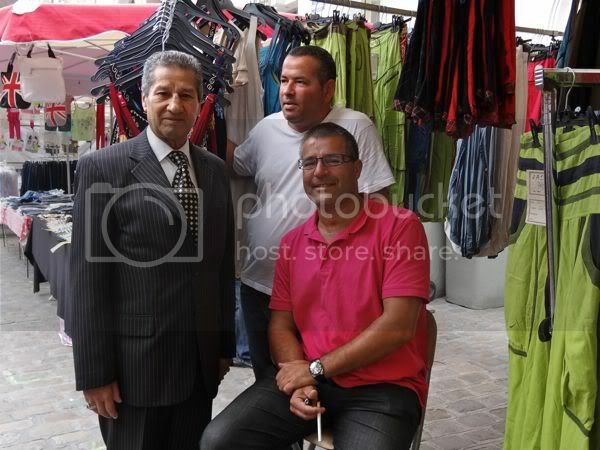 I had become acquainted with Noureddine (from Tipaza, Algeria) on previous visits because his market stall stood across from my favorite tea salon. Every year I’d buy something from him and we’d exchange language lessons. This year it was dis-moi, “tell me,” e.g., tell me if it doesn’t work. He would do his bad Clint Eastwood impressions and tell me about the other tourists (alas, Americans) who would come through. They’d not even bother with a bonjour before trying to bargain down as if it’s a brocante or flea market, not a business like the bricks and mortar store across the street. I say if you can afford to fly to France, you can afford the €25 dress he’s selling. I would take a seat for the morning at the busiest intersection of Place François Rude and either write in my travel journal or snap pictures from where I sat. And I took pictures of Noureddine because day after day he waved to me and signaled me to take pictures of him. Sometimes he'd call me over to translate for an English-speaking tourist and sometimes he'd call over for a photo one of his friends who had stopped by to say hello. That’s how I met Redouane and Mohamed this summer. How can anyone miss Mohamed? 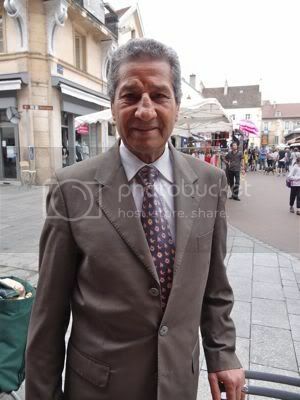 He was dressed so absolutely elegantly every time I saw him on market day. And the ties. Oh, the ties. No conservative red-striped ties for him. One day when he looked particularly fine in a sharkskin suit shining in the (momentary) sun and bold floral tie I asked why he was so dressed up. Ah, la fête, le jour, he answered. He was still celebrating Bastille Day from the day before. But each time I saw him and told him he was looking très beau he gave me a different reason for it. Every day was a celebration. Last Saturday, after we had talked about his home in Algers and my two kids, the weather was looking threatening so I asked him to sit with me under the umbrella (no tea because of Ramadan, of course). But he had no time. “Oh, oui," I said, proud of my new French word. "Vous êtes le Flâneur du marché” (defined in this recent story). Oui, oui, he laughed. He had to touch base with all his friends in the market, rain or shine. When I showed Mohamed the photo I had taken of him with Noureddine and Reduoane, he pointed to it, nodded, and said, “Ah, trois beaux garçons.” I had to agree. Shortly after meeting Reduoane, from Castellón, I tried to impress him with my Spanish. That was a major fail, though, because my skill from one year of Spanish in high school was even worse than my French. Once I got past Hola! Que tal? and he switched from French to Spanish I became ignorant in two languages. “Your Spanish un poquito?” Reduoane joked, indicating with his thumb and index finger about a centime’s width apart. He educated me about the fresh fish that he ate in his Mediterranean coastal town in Spain. When I mentioned all the fish on Dijon menus, he screwed up his face in disgust and waved his hand to pooh pooh the whole idea of river fish. “No, le poisson de la mer ...” he started, launching an homage to the salty ambrosia from his sea, quickly turning his hand back and forth like the fresh-caught ones flopping on the dock, waiting for him to buy and take them home for dinner. I didn’t understand a word of Reduoane’s fish reverie, but I knew when Noureddine and Mohamed nodded in agreement that some day I’d have to get to the Mediterranean, if only long enough to savor one seafood meal from my new friends’ home. I’d like to offer an honorary beau garcon to Sebastien, half French/half Spanish from Valencia (near Reduoane’s Castellón). 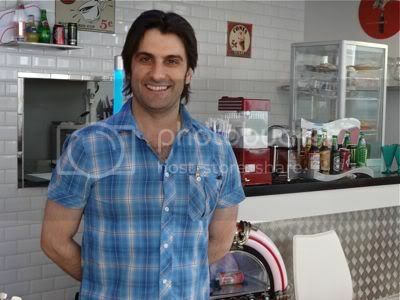 He runs Ritchie’s Diner Café near Dijon’s train station and had the same boisterous personality of any American diner owner. 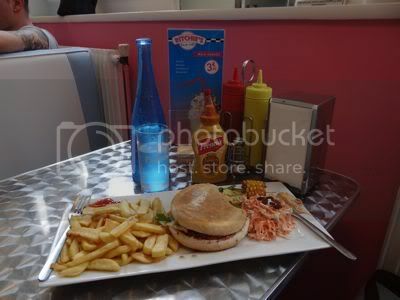 I was drawn to the audacity of a Frenchman trying to replicate American diner food. But when I saw through the window that it had real, American, French’s mustard sitting on the tables instead of the ubiquitous Dijon stuff (love to cook with it; hate it on my sandwich) I had to give it a try. When engaging in a little friendly Frenglish conversation as I ate, I found the words to express how excited I was to see my favorite bright yellow condiment and asked if could I buy it anywhere in town. He got his through a wholesaler (yes, his English was good enough to know that word), he said, but offered to sell me a large bottle. If it had been the beginning of my trip instead of the end, I would have taken him up on the offer. Fitting in when traveling alone can seem as difficult as a backward 2 ½ somersaults with 2 ½ twists in piked position (look it up). I still have a long way to go until I’ve formed my own little French community equal to friendships at home. However, when you’re willing to take out on your own occasionally you soon find that you’re never lonely long. Do you enjoy traveling alone? Why or why not? What's your favorite experience if you've been out there on the road solo? Share it here. I have traveled to Paris twice by myself and loved the solitude, talking with people in the cafés. I keep a journal and along with my camera, I am never bored during a long French meal. Love your friends here and I have bookmarked this post so I can find them on my next trip to Dijon (April 2012). When I get down South in the US again we'll have to get together and share French notes. It looks like you are in good company...well done you! I love travelling alone but I have to admit that speaking the language helps a lot. I am glad that you are enjoying my home country! Traveling alone but with someone to meet at the next place, just for an hour or even a day or two, would be divine. Enjoyed your posts. Will there be more? Hi, Cathy. Welcome to my space. You're right about having someone to meet while traveling, someone to look forward too. I'm very big on cultivating some kind of relationship everywhere I can. I had a friend I was supposed to meet at a music festival, but after my wallet was stolen in Paris (read that here http://www.traveling-through.com/2011/07/down-and-out-in-paris.html), I couldn't drive and had to find other people to entertain me. Yes, there are more posts to come, although not all about France. And I'm going to try to be good about getting more of my photos posted.